TINA’s legacy is revealed in this chart of the Venezuelan Bolivar, which has plummeted from 10 to the US dollar to 5,800 to the USD in a few years of rampant money-emission. Every conventional “solution” to the systemic ills of our economy and society boils down to some version of free money: Universal Basic Income (UBI) schemes– free money for everyone, funded by borrowing from future taxpayers (robots, people, Martians, any fantasy will do); debt jubilees funded by central banks creating trillions out of thin air, a.k.a. free money, and so on. Free money is compelling because, well, it’s free, and it solves all the problems created by burdensome debt and declining incomes for the bottom 95%. Just give every household $100,000 of free money that must be devoted to reducing interest, then give every household $20,000 annually for being among the living, and hey, a lot of problems go away. But is creating money out of thin air really truly free? There are two appealing answers: yes and yes. If the Treasury literally prints money, it’s almost “free,” and if the Federal Reserve creates money and buys bonds paying near-zero yields, the money that is borrowed into existence is almost free because the interest due is so minimal. The problem, of course, is that creating free money is not quite the same as creating new wealth. New wealth is a new gas/oil field that comes online, new cropland that produces a new source of food, new goods and services, etc. In effect, every dollar of free money reduces the purchasing power of all existing units of currency unless the expansion of output (additional goods and services) matches or exceeds the added dollar. This line of thinking is driven by two realities: governments have issued many promises to their citizens, employees, corporations, etc. These include pensions, medical care, backstops against losses, tax breaks, subsidies, and on and on in an endless profusion. In order to fund these promises, governments must borrow immense sums of money that will never be paid back. The only way governments can afford to borrow immense sums that pile up oh-so quickly is if interest rates are kept near-zero for all eternity (or until the current generation of politicians retires, or the currency follows Venezuela’s currency to near-zero, whichever comes first). 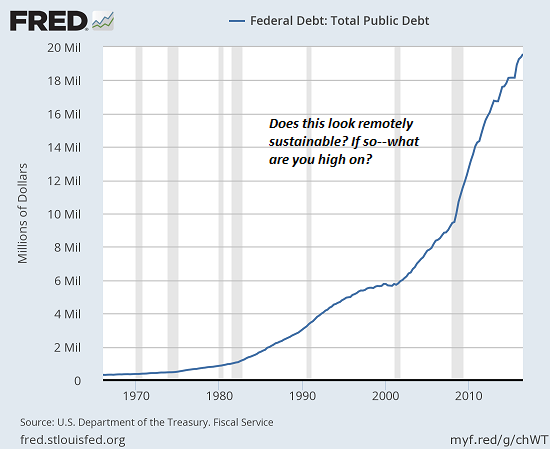 As long as interest rates are kept near-zero, even $20 trillion in debt is manageable. Never mind if debt triples every few years–it’s affordable if interest rates are near-zero. Everybody can borrow more at near-zero rates: governments, banks, consumers–it’s the cure-all to every debt burden. The problem is rates can never rise, lest the house of cards collapses. $20 trillion at 5% interest requires an annual interest payment of $1 trillion–one-third of all federal revenue. $30 trillion at 10% interest would consume 100% of all federal tax revenues, leaving nothing for all the programs, obligations and promises of the central state. Allow me to introduce TINA–there is no alternative to low rates forever and emitting of immense sums of new currency (not new wealth or productive output–just new currency) to fund various modern-day versions of bread and circuses for everyone. 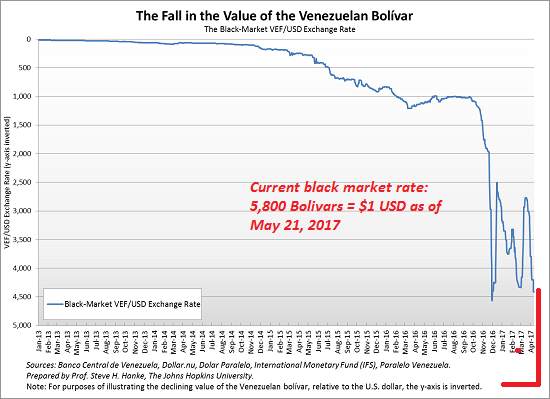 TINA’s legacy is revealed in this chart of the Venezuelan Bolivar, which has plummeted from 10 to the US dollar to 5,800 to the USD in a few years of rampant money-emission. Free money is certainly compelling, at least to those desperate to cling to power, but sadly, newly emitted currency is never actually free. At the height of its giveaways of free bread and endless distractions of public entertainment, Rome’s population is estimated to have been close to 1 million. After the collapse of bread and circuses, the population of Rome eventually fell to roughly 25,000. But no worries–this time it’s different. 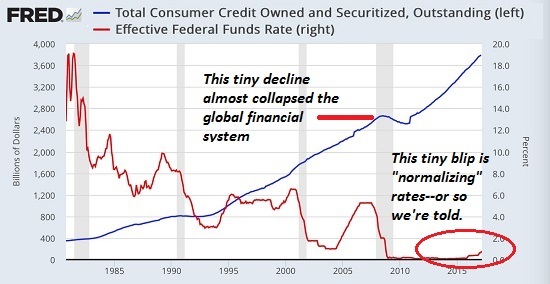 We’ll get away with it because we buy our own debt, technology is deflationary, and so on. Simply put: the free bread and circuses will never end because we’re so powerful and nothing is outside our control.